I have done a tad better than of late, as I have managed to only post 2 of my side by side photos this time. I'm cheating a little this week as this is from the previous week, BUT I love everything about it and I couldn't let it slip by unnoticed. Plus with my Mum visiting and overall rubbish weather I never got that chance to get out and take some pics. Anyway, it's a small section from Window 99 Brunswick Street in Fitzroy. Which is an installation space at you guessed it 99 Brunswick St. 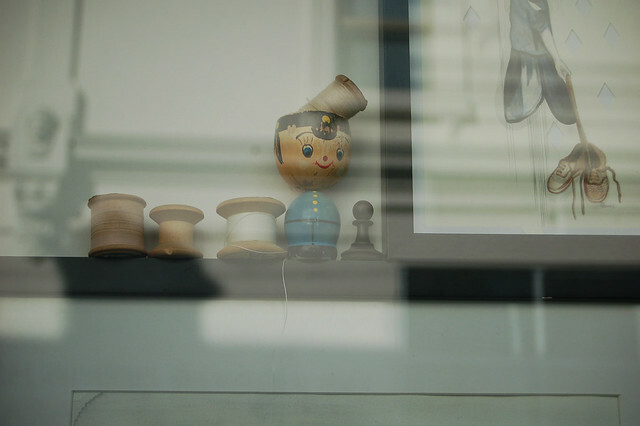 I love the liitle egg cup figure, the shoes in the picture, the cotton reels and also mostly loving the reflection of the building across the street in the glass of the window. This was just some of the randomness that Melbourne is famous for. 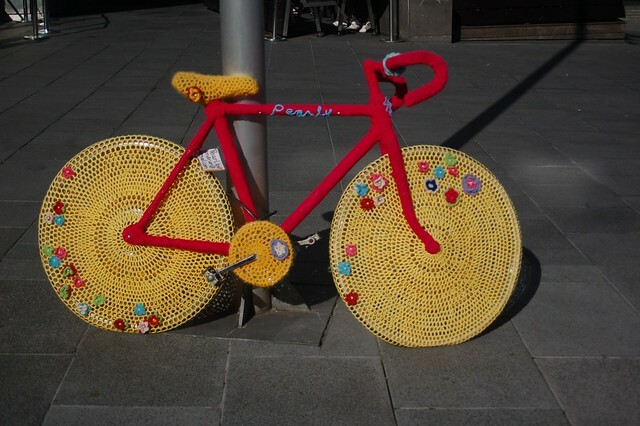 I was in the city over the weekend and we saw this random crochet covered bike in locked up against a lamp post. Not too sure what it was all about but they were doing a 12hr 'Knit In' in Federation Square so I can only presume it had something to do with that. Nonetheless super fun!